Help your students tell their own stories! 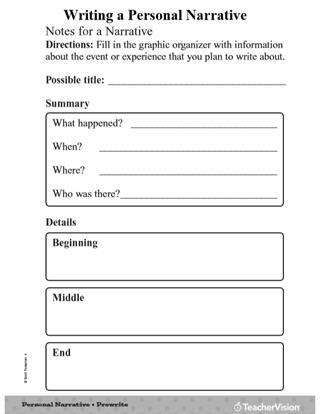 Use this printable writing packet to teach students how to write a personal narrative paragraph. A model story organizer, a blank story organizer, and a personal narrative at four different stages of completion are provided. Incorporate into your class lesson or use as a homework assignment.